Alter The Press! 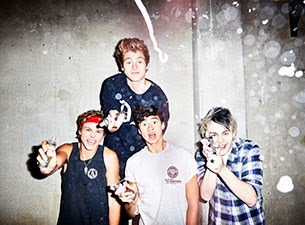 : 5 Seconds Of Summer Cover Green Day's "Boulevard Of Broken Dreams"
5 Seconds Of Summer Cover Green Day's "Boulevard Of Broken Dreams"
5 Seconds Of Summer surprised fans at their recent show in San Francisco with an impromptu cover of Green Day's 2004 single, "Boulevard Of Broken Dreams." You can watch a fan-shot clip of the band's short rendition of the track below. Dates for 5 Seconds Of Summer's current North American headlining run and tour with One Direction can be found here.